At a Planning Commission meeting on Jan. 9, Assistant City Attorney Alexander Abbe led a study session about the abundance of new housing legislation for 2017 and 2018. 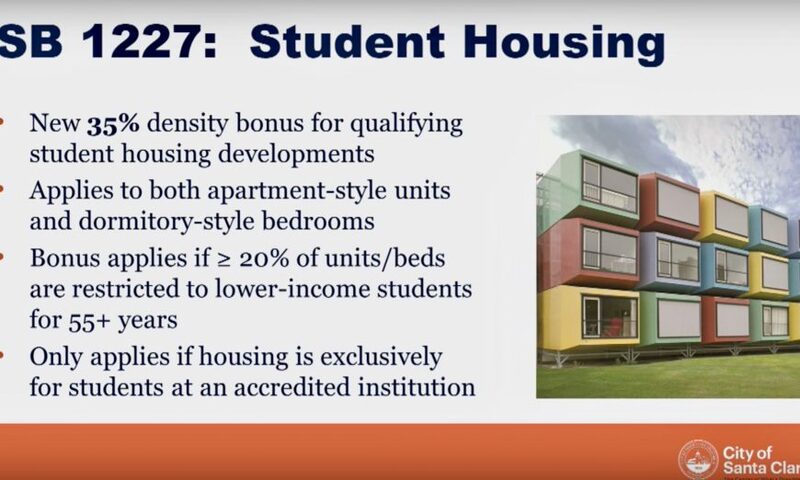 Last year many bills were passed including inclusionary housing legislation for both owned and rented units, a Housing Accountability Act to speed up development, and No Net Loss Rules to encourage creation of affordable housing. Another law, SB 35 came into effect, which will require the City of Santa Clara to approve projects proposed by developers that have 50 percent affordable housing. The law also prohibits the City from disapproving projects listed in the Housing Element of the General Plan. 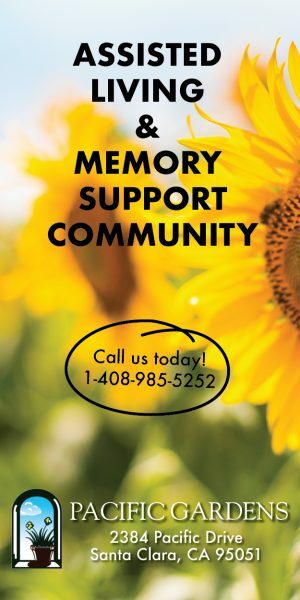 State legislative bills for 2018 include one allowing municipalities to waive building permit fees for seniors who want to build disability accommodations in their homes, and another that bolsters supportive housing specifically for homeless individuals. 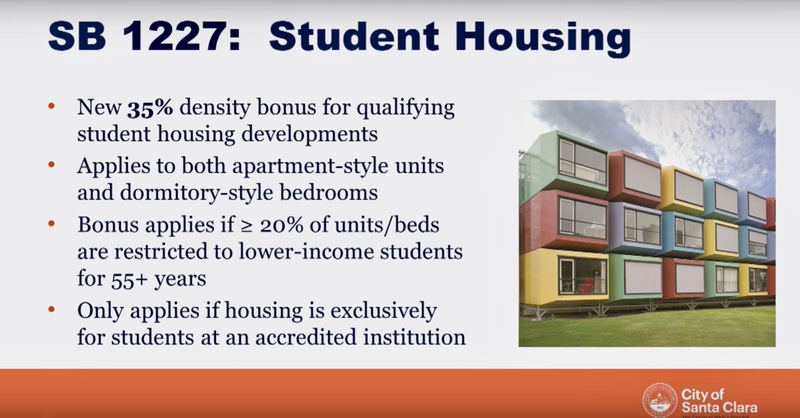 There’s also a piece of legislation providing a 35 percent density bonus for student housing, which applies to both apartment style and dormitory units or beds. The project must be associated with an accredited institution to qualify for the bonus. Subsequent to recent concerns raised by members of the community regarding City Council activities, Abbe reminded commissioners about the importance of due process and impartiality in official decision-making about projects, as is required by law. Due process doesn’t require commissioners to lack personal opinions but rather to disclose disqualifying bias against a person affected by a decision. A use permit was approved by the Planning Commission to allow a Shake Shack at 2855 Stevens Creek Boulevard to remain open until midnight on Fridays and Saturdays, as well as serve both food and alcohol during those extended hours. The approval came with a condition to conduct reviews after six months and one year to ensure that the changes don’t result in excessive police activity. If such issues result, the hours will revert back to 11 p.m. closings on those nights after one year. “I welcome that there’s something open past 9 o’clock in Santa Clara,” said Commission Chair Sudhanshu Jain. A gas and service station at 3725 El Camino Real is up for transformation into a retail convenience store and possible restaurant. Commissioners approved a use permit allowing for the conversion, which would retain the gas pumps and replace three service bays with a retail store and possible sandwich shop. A driveway on the property will also be filled in with landscaping. Commissioners voted on who would replace Raj Chahal as vice chair following his move to City Council. Commissioners Lance Saleme and Anthony Becker vied for the position with Becker winning a majority of the votes. Becker’s former position of secretary is now vacant and a vote is planned for the next meeting. City Council is expected to post a public notice regarding one vacancy on the Planning Commission, with the recruitment period to end on Feb. 21.